Reed: “Let me see if a 7-iron adds more. The spectator who was recording the incident on his smart phone and who later posted it on Twitter, claims that this comment was from Reed’s wife, Justine. This is probably correct, as she used to be his caddie and is known to almost always accompany him at these events. Reed: "I guess my name needs to be Jordan Spieth, guys." Official: “Patrick, you just play away”. Reed: “I want a third opinion…….I’m allowed that……..yeah I do, I do want a THIRD opinion….. from an UNBIASED source.” (my caps). Wow! If he is looking for opinions, mine is that this is totally unacceptable behaviour from a leading, tour golfer that I hope will be followed up by the PGA Tour (and Jordan Spieth!). I cannot confirm whether Reed did get his demand for a third, official ruling on the incident, which would be unique in my experience, but it seems most unlikely that free relief was permitted, as he double-bogeyed the hole. Exception: A player may not take relief under this Rule if (a) interference by anything other than an immovable obstruction makes the stroke clearly impracticable or (b) interference by an immovable obstruction would occur only through use of a clearly unreasonable stroke or an unnecessarily abnormal stance, swing or direction of play. This is a tricky and subjective area of the Rules, which I have previously tried to explain in this blog. The deciding factor in arriving at a ruling is whether the player would have chosen the same club and stance, and would take on the same shot, if the immovable obstruction was not there. I am disappointed to have to highlight another instance of a well-known professional golfer showing disrespect to a Rules official. Many tour officials are volunteers and in almost every case they have a far better knowledge and understanding of the Rules of Golf than the players that they try to assist with their rulings. 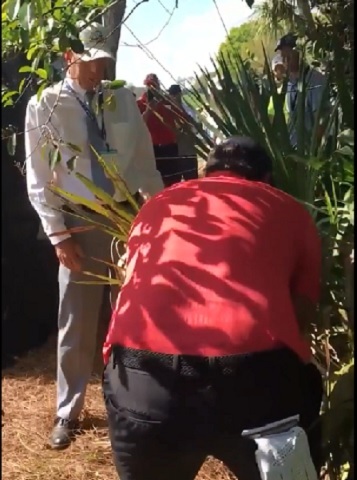 Note: Since writing the first draft of this blog most of the copies of the recorded incident have been removed from golf media sites by the PGA. The video on the original Twitter tweet by @ssteele55 has also been removed. However, at the time of writing the video is still available at this link. Within a few weeks, I expect to be in a position to update readers with how I plan to continue my mission to assist golfers of all abilities to improve their knowledge and understanding of the Rules of Golf. In the meantime, if you are not already receiving these blogs by email, enter your email contact address in the 'Subscribe via email' box at the top right corner of any blog page, so that you do not miss anything. Thanks for your hard work. Your work is highly informative to golfers everywhere. If Reed had received a third opinion that was favorable, would he be entitled to ignore the previous two opinions or would he have to accept a 2:1 against vote, in which case there is no point in getting a third opinion ? My understanding is that the last ruling received from an official source is the one that counts, but then I have never heard of any player summoning a third official to make a ruling.. Some have queried why Reed did not choose to play a second ball under Rule 3-3, but if he had done so, the Committee making the subsequent ruling would probably be made up of those officials that had already given their ruling! Sorry as it’s wrong thread but can you help. A ball is hit towards a green but lands short into a fast flowing stream (Ridgeway 3rd) The ball is carried by the current and is found in an Out of Bounds area of that same stream on another hole (Ridgeway 9th). a. Does the player accept it is Out of Bounds and go back to where he hit the shot from? b. Drop with penalty at the point where the ball entered the stream? a) The ball was out of bounds, Decision 26-1/7.